JOWAI: Late Rev. Vincent Kympat-the first Bishop of Jowai dioceses was buried on Monday inside the St. Therisa Cathedral Church, Jowai Parish as thousands of people gathered at the Bishop House at Lum Bih Syntiew and at the Church premises to pay their last respect to the departed soul. Bishop Vincent Kympat, 65, died last Saturday at Jowai Civil Hospital due to cardiac arrest. 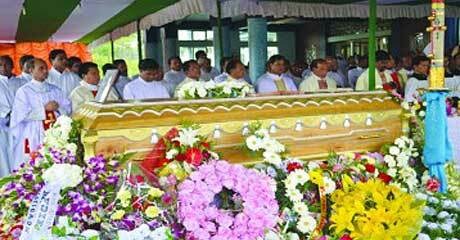 The funeral was also attended by Bishops of North-east India including Arch Bishop of Gauhati Arch-diocese, Arch Bishop of Imphal Arch Diocese, Bishop of Nongstoin diocese besides others.